My personal challenge started, very tentatively, on the 19th July 2014 and ended on the 1st October 2014. I really enjoyed the challenge and although didn't have much confidence when I started but the time the end came around, although I don't feel that my drawing improved much, I was much more likely to tackle subjects that I never would have dreamed of tackling when I started. Seeing - Week 6 - Homework Part 2 The next lot of homework that Liz set for us was to draw a building. With her being an architect she gave us a number of tips for when drawing buildings. It was a dull and dismal day and I decided to draw our house - it's kind of wonky, I think I definitely need a lot more practice! Once the pen hits the paper finish the drawing! And what did the great man himself have to say about my kitchen drawing? Yvonne, you have made a gorgeous little masterpiece. 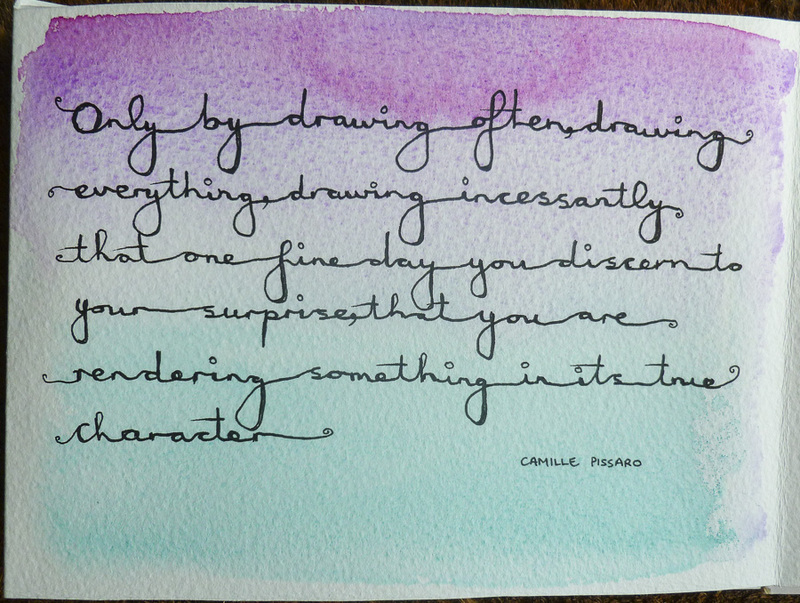 Your line work is so delicate and perfect. Your watercolor work is spot on. Your work has great personality to it. I even love the texture of the paper you use. You should be very proud of what you did. 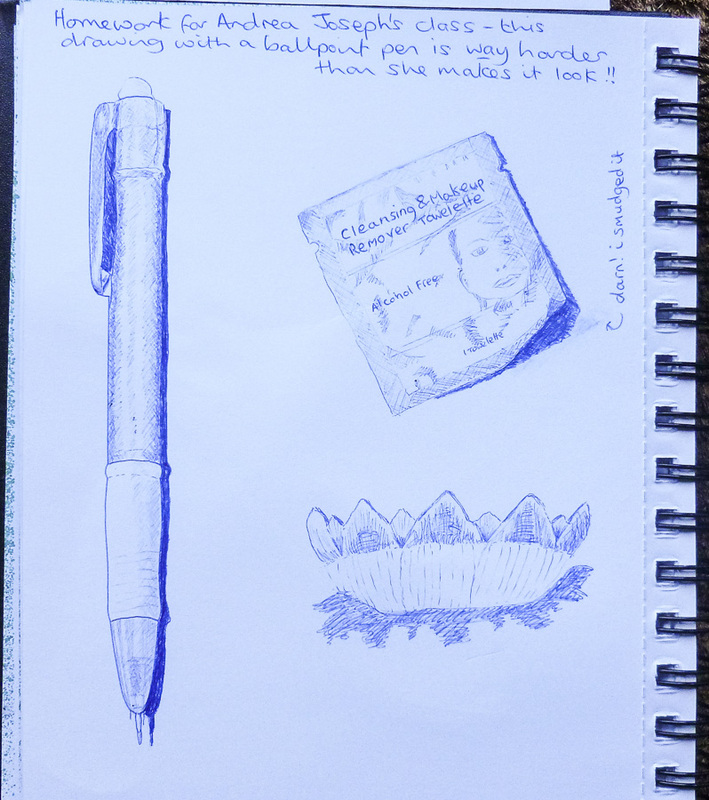 The tutor for week five of Seeing was the totally incredible Andrea Joseph - what that girl can do with a ballpoint pen is truly amazing! Andrea's Blog Andrea's Flickr Andrea's Etsy Shop Andrea is one of the few British tutors on the course and was very generous in her advice and teaching, lots of video demos and she went through some of her sketchbooks too. The first homework was a lettering piece - we had to choose a quote that we liked and write it out. I chose this one by Camille Pissaro. Lastly Andrea demonstrated drawing a collection of items and set us the task of drawing a collection of our own - in ballpoint pen of course. I had a bag of buttons that had come from my late mother-in-law's house so I chose them. I really enjoyed this homework and indeed the whole week. I don't think that I'll be making a habit of doing drawings with ballpoint pen - Andrea made it look way easier than it really is. I guess with practice it would become easier - I found myself pressing too hard occasionally - in Andrea's video she used very very light, soft strokes when doing the cross-hatching and this is where I found the difficulty - I felt very clumsy. 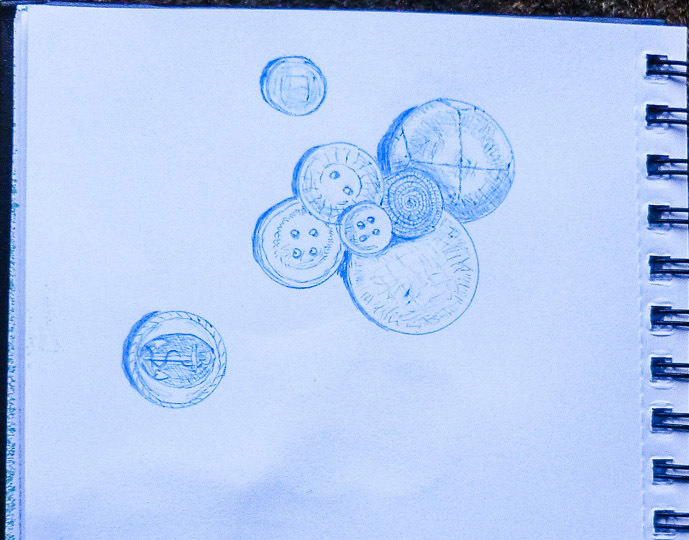 My favourite button to draw and the one that turned out pretty good was the large round, leather-covered button. Sadly week 6 will be the final week of Sketchbook Skool for this semester :-( but i'm looking forward very much to it, Liz Steele is leading the last class! The teacher this week for Beginnings was Jane LaFazio and in her demo she showed us the process that she goes through - how she selects what she wanted to draw, doing a rough pencil sketch then adding pen and finally watercolour. 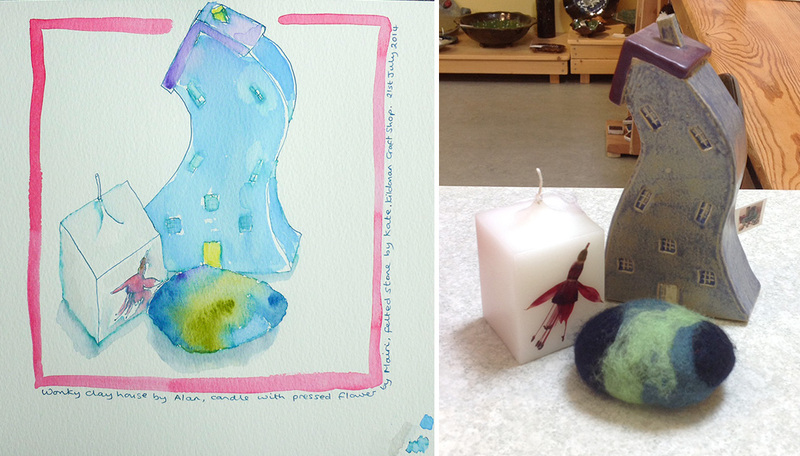 Jane loves to work in mixed media, including stitchwork and she talked us through some of her sketchbooks. Our homework was to create a grid drawing. 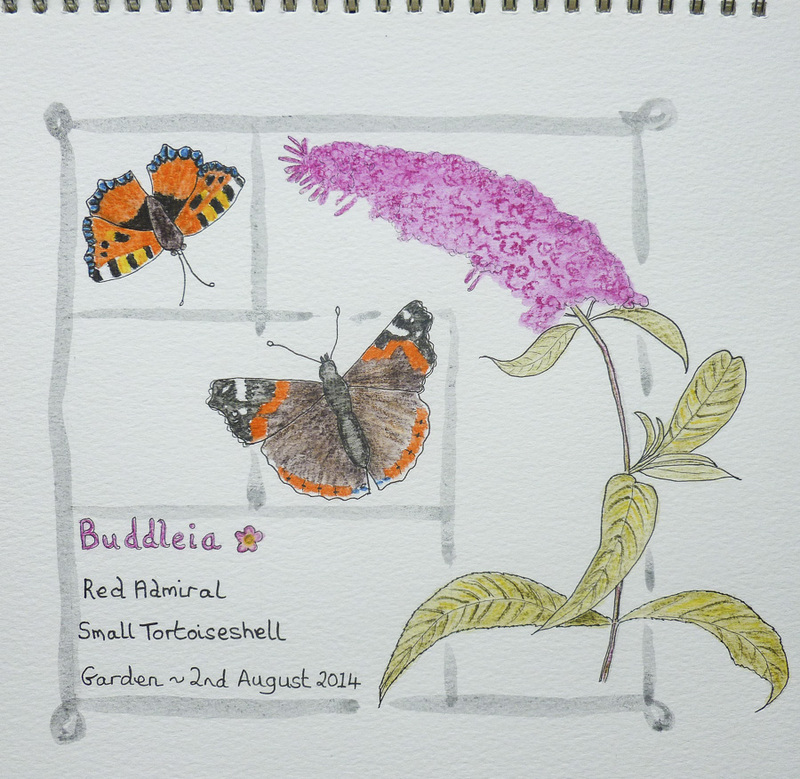 Jane suggested fruit or vegetables but we'd had a beautiful sunny day and there were a lot of butterflies in the garden, especially on the Buddleia which is fully in flower (and unlikely to stay that way here - the wind and the salty air soon knocks the blooms down). The very first online courses that I participated in were by Cathy Johnson so I was looking forward to learning a whole lot more from this lovely lady, especially as a lot of her drawing is bird and nature orientated. Cathy Johnson's website Cathy Johnson's blog Cathy demonstrated techniques for sketching birds - both from life and using photographs - then homework was to do our own bird sketch. I chose a House Sparrow, it turned out OK(ish) it was a little bit out of shape. Maybe i'm just picky when it comes to bird art - I think it stems from knowing birds so well. Anyway here is my homework, followed by some links to a couple of great bird artists. The tutor for week 3 of Sketchbook Skool is the fabulous Prashant Miranda - I loved his gentle, laid back style of teaching. His videos were filmed in India and he showed us how to do a graduated watercolour wash. The demo video was filmed at a beach in Goa, bringing back happy memories of the two months I spent in Goa in 2009. Homework was to paint our own watercolour sky so I painted the beach here in Uist which is just a 10 minute walk from home. I'd been waiting a few days as the sky had been overcast but today was glorious, 24.8'C - just about as good as it gets here in the far-flung north west. I would so love to be able to draw birds. Birds are my big passion in life but my usual efforts at drawing them are at best pathetic - i'm not being unduly unkind to myself, it's true! Perhaps because I'm so familiar with the subject I get uptight about it. I know that when i'm looking at other people's bird art I usually start off by checking whether they have drawn in the correct number of primary, secondary and tail feathers. Sad but true! 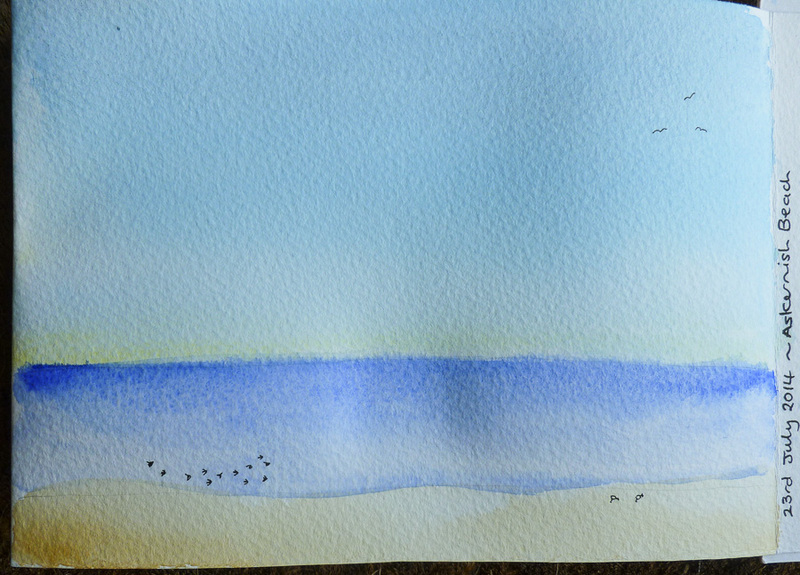 I wanted to draw some birds into the beach scene, there were small flocks of Sanderling flying along the shoreline and a few gulls over the water plus a couple of Redshank feeding on the sand. I have the rather ancient book Drawing Birds by John Busby so looked in there for some advice on adding a few stylised birds. Here is the result. Well i'm off up to the Isle of Lewis tomorrow and will be staying until Monday, my sketchbooks and watercolours are packed so i'll see what turns up. The third week of Sketchbook Skool "Seeing" is presented by Brenda Swenson. I must admit I had never heard of Brenda before this week but I immediately warmed to her, she is very gently spoken and has a lovely way of teaching and engaging the viewer. Our first homework task for brenda's class this week is to make a continual line contour drawing (no lifting the pen from the paper) and we were asked to select objects with variety (shapes, textures and sizes). and finally a drawing of three objects, taking 10 minutes. Continual line contour drawings, 1 object, 2 objects, 3 objects.